We featured this a few months ago – this was a BBC play done in the days when there was just One Channel which was BBC. This drama went out ‘live’ as they tended to do in those days – and not only did it go live on Sunday evening 6th December 1953 at 8-40 pm they all did it again ‘live’ on Thursday December 10th 1953 this time at 7 pm – Almost 65 years ago nearly to the day. Apparently this play was done because Richard Todd, then at the height of his film popularity, expressed interest in playing Heathcliff and the BBC arranged for an adaptation to be made. 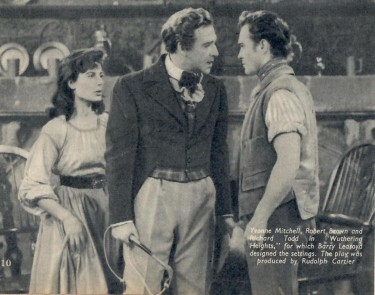 Above – a tense scene – Yvonne Mitchell as Cathy with Robert Brown as Edgar Linton along with Richard Todd’s Heathcliffe. Sadly no recording of this survives now – the would be before the days of early tele-recording I know but I had hoped there might be a copy. I remember seeing this as a child on our TV at home – maybe a 12 inch screen I would guess – but it was good – and memorable. Nigel Kneale wrote the screen play – none other than the Quatermass writer – and that would come shortly after this. 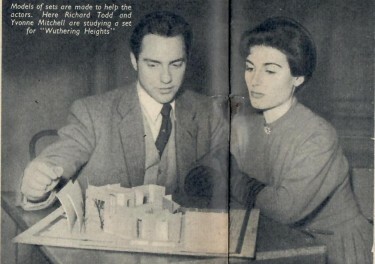 The Caption on the pictures says – Models of sets are made to help the actors. Here Richard Todd and Yvonne Mitchell are studying a set for ‘Wuthering Heights’ Above: The Two leading Actors Richard Todd and Yvonne Mitchell view models of the sets used – I imagine to get an angle on moving from one studio set to another in a ‘Live’ production. I do remember one scene where Richard Todd as Heathcliffe was in the door of a stable brushing down the rear of a horse – obviously a model horse – I will look back at Richard Todd’s Autobiography- he may say more about this. Robert Brown who played Edgar Linton went on to play Gurth – Roger Moore’s companion in the Television series Ivanhoe – which was very popular. This would come shortly after this production – of course he later played alongside Roger Moore as ‘M’ in a number of James Bond Films. I have just read about him – and one thing that struck me was that he was born in Swanage in Dorset, England – and he died there. He must have lived there all of his life which I find admirable. I have to admit that Swanage is a particular favourite seaside location for me. It is like a place that is locked back in time somehow. Lovely place.